Once upon a time when reason was more prevalent in the world than nowadays, Le Monde Diplomatique provided intelligent commentary and important facts about contemporary events, going into depth about various subjects. However, over the years Mondiplo --said to be linked to the French foreign ministry-- became more and more the captive and the vehicle of simplistic slogans about the "Third World", "palestine liberation" and such. Now it takes an outrageously simplistic anti-Israel stance, at the cost of making itself ridiculous. As the Free French and the French Resistance used to say during the German occupation of France, Paris Radio lies, Paris Radio is German [Radio Paris ment, Radio Paris est allemand -- rhyming in French] we may say today: Mondiplo Lies, Mondiplo resembles Nazi propaganda. Is that unfair? Consider a headline in Le Monde Diplomatique [English ed. translated from the French--February 2007]: "Jerusalem's Apartheid Tramway." This headline is used although nothing in the article justifies it. Now, more than four years after the agitprop article appeared, the tram has begun service and Jews and Arabs are riding the tram in the same cars. 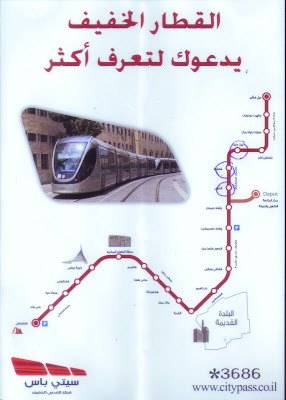 And the tram stops in Arab neighborhoods, Beyt Hanina and Shu`afat [two stops] as well as near Damascus Gate where it can serve both Jews and Arabs. Indeed, Arabs ride the tram and wait at the stops in Arab neighborhoods. I rode the tram southbound yesterday and stood next to an Arab woman and her two daughters. They got on in Shu`afat neighborhood and were standing next to me. Interestingly, they were not wearing head coverings. The mother was relaxed but the older, teenaged daughter --dressed in tight pants and with painted fingernails-- was looking around in a very suspicious way, maybe to see if we had horns. Since the tram was air-conditioned, I didn't mind standing. How do the mendacious journalists for LeMondeDiplomatique [English ed.] get to defining the tram as an "apartheid tramway"?? Their reasoning is strikingly flawed. They quote an Israeli official spokesman as saying that: "the tram must serve the Jewish quarters (Israel’s politically correct term for settlements) such as Pisgat Ze’ev, as well as Arab quarters like Shu’fat." They do not deny that Arabs would be allowed to ride the tram but speculate if Arabs will be able to afford to travel on it. Then they insinuate apartheid or what used to be called jimcrow in America: "How will the settlers react to seeing Arabs travelling on the tram? One person we spoke to wondered whether there should be separate carriages for Arabs and Israelis." This is all speculation at best, contradicting the pains taken by the Israeli spokesman to explain the intention to make the tram available to all. Yet the Mondiplo authors insinuate the possbility of apartheid. Nevertheless, despite having no real grounds to claim "apartheid" they still entitle the article: "Jerusalem's Apartheid Tramway." This brings LeMonde Diplo close to the level of pre-WW2 Nazi anti-Jewish propaganda. Maybe not quite there. But on the way. So here was another lie about "apartheid" in Israel that turns out to be totally false. Further, some anti-Israel group in France sued French firms involved in the tram project. Supporters of the suit throw around slogans and pejoratives like: apartheid, illegal, "occupied" territory, international law, "judaizing" Jerusalem [which has had a Jewish majority since 1853 or earlier] and other usual epithets. Here is a video in French from France24 in which Arabs interviewed claim that it would be of no use to them, because --inter alia-- there would be no stops in Arab neighborhoods [ici&ici][I originally saw this story on France24 in English but cannot find the English], which is false, as we have seen. Another lying slogan thrown around in the context of the tram claims that Jewish neighborhoods in "east Jerusalem" were built on "stolen land." The stolen land argument is also false since Jews began to purchase much real estate in and around Jerusalem in the late Ottoman period --from the 1860s to 1914-- when it became possible for Jews to purchase real estate. This "stolen land" claim is a big lie but a separate issue. Suffice it to say that Neveh Ya`aqov and much of Pisgat Ze'ev --served by the tram, among other areas -- were built on land belonging to the pre-1948 agricultural village of Neveh Ya`aqov [founded 1924]. Here's a pix of a flyer in Arabic distributed by the CitiPas [OR City Pass] company that operates the tram for the purpose of attracting Arab riders. Note the diagram of the tram's route. The three tram stops encircled in blue ink on the diagram are in Arab neighborhoods [Beyt Hanina and Shu`afat (two stops in Shu`afat)]. Will Mondiplo admit its gross misuse of the apartheid label?